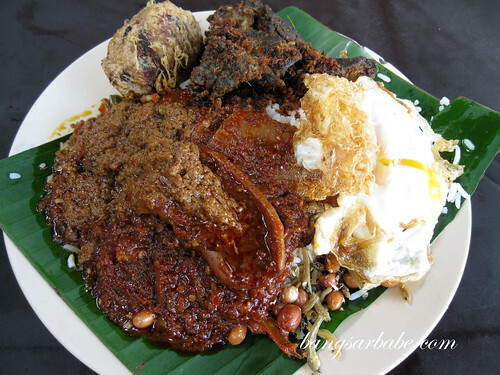 My crazy plate of nasi lemak! 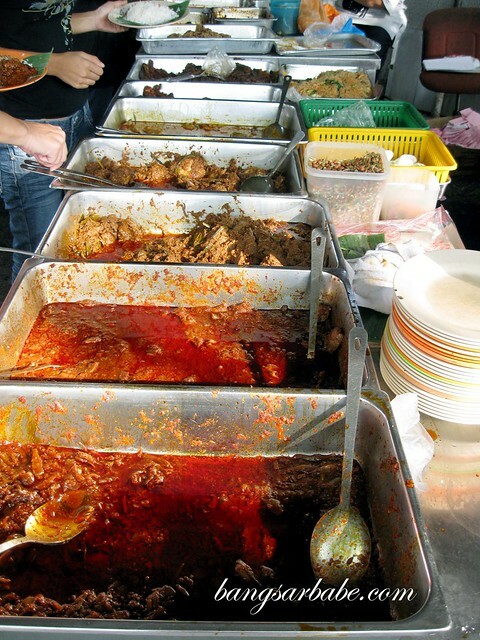 There are many versions of this traditional dish, from the humble RM1 packet to the upmarket version found in posh restaurants, cafes and even in airlines. For me, the thought of creamy coconut rice with sambal and egg is enough to make me salivate. 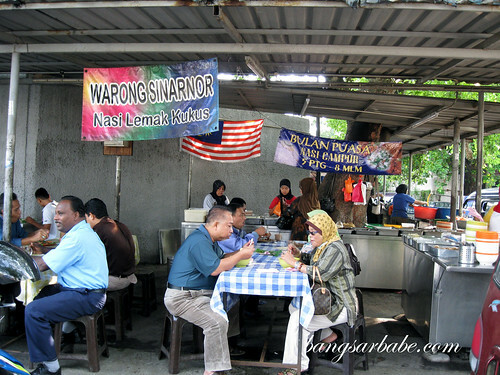 My favourite nasi lemak is from Warong SinarNor, located at Jalan Dua, Chan Sow Lin. rif introduced this nasi lemak to me almost 7 years ago and until today, it remains our favourite place for nasi lemak. A good nasi lemak has to fulfil certain criterions. First – the rice. The rice must be fairly firm and not soggy or clumped together. It is best fluffy, with the rice grains separated. If the rice is sticky, it does not make the mark. It must also be creamy (lemak) and fragrant from the addition of coconut milk in the cooking process. Pandan leaves are customary, to impart extra aroma to the rice. Second – the sambal. The sambal must have kick or oomph. Some sambals are slightly sweet, which I don’t find very appealing. I love my sambal fiery with hint of sweetness from the caramelised onions. 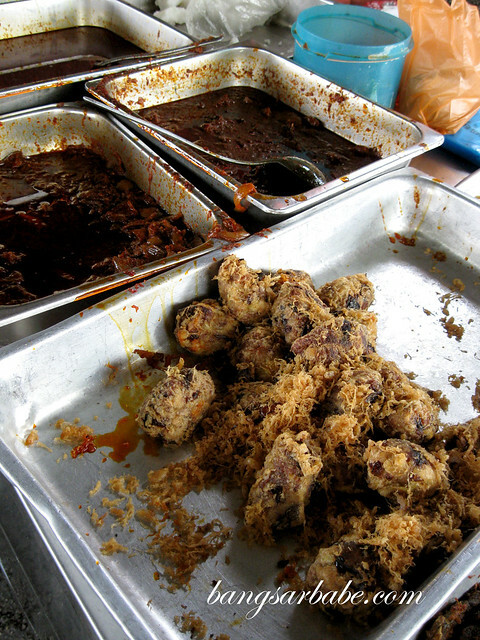 Third – ikan bilis (fried anchovies). It has to be crispy, not hard like rocks. 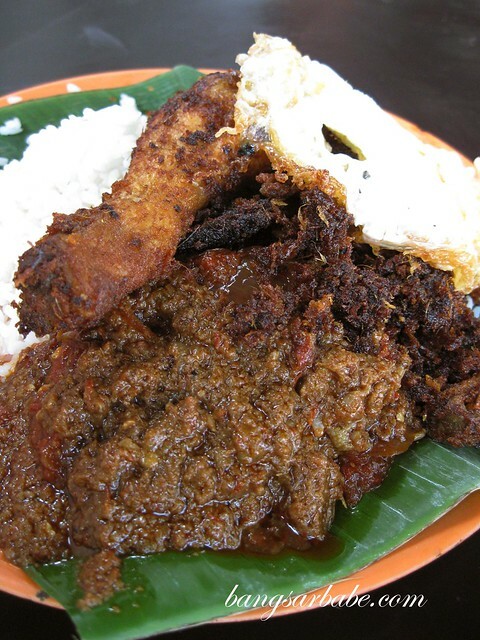 I’ve eaten a few rock hard and bitter ones in my nasi lemak, and it marred my nasi lemak experience. Like most nasi lemaks, Warong SinarNor’s version comes with cucumber slices, ikan bilis, peanuts, a splodge of fiery sambal and half a hard-boiled egg. There are so many choices; it’s hard to decide. After pondering for a few seconds, I settled for the sambal sotong, bergedil (potato cutlet) and deep fried paru (cow’s lung). 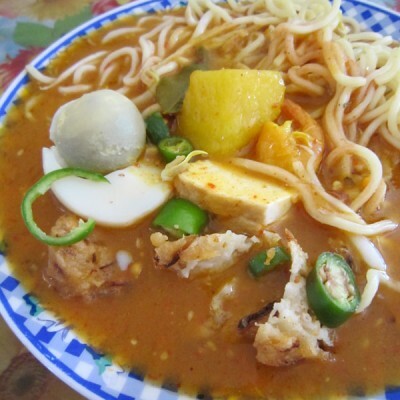 I also replaced the hard-boiled egg with a runny bull’s eye (mata kerbau). My nearly over-loaded plate cost RM6.20, which I thought was pretty reasonable. As I sat down next to rif, I was only slightly embarrassed when a few patrons across our table starred at my plate (and I believe, my gluttony) in disbelief. I couldn’t care less, and dug into my steaming hot plate of nasi lemak. Ahhhh…it’s been a long time since I last ate here. This was one of the indulgences I had to give up when I switched jobs from KL to PJ. The rice was firm, well separated and fluffy. It was lemak (rich), but not overly so, and aromatic from the pandan leaves added in the cooking process. The nasi lemak was served on a banana leaf, which gave the rice extra flavour and aroma. I helped myself to two dollops of sambal, which packed quite a punch. This was by far the best sambal I’ve eaten. It was fiery, slightly sweet and lemak-ish. Yes, the sambal had a touch of richness to it. The squid was nearly perfect – tender and flavoured by a spicy sambal sauce. Sambal sotong is usually sweet, but this version was both sweet and spicy. Brown squid is used, because it is larger and meatier. I chose the pieces swimming in sambal, and they were remarkably tender. The runny yolk was simply the “icing on the cake”, as it added extra creaminess to my already decadent plate of nasi lemak. 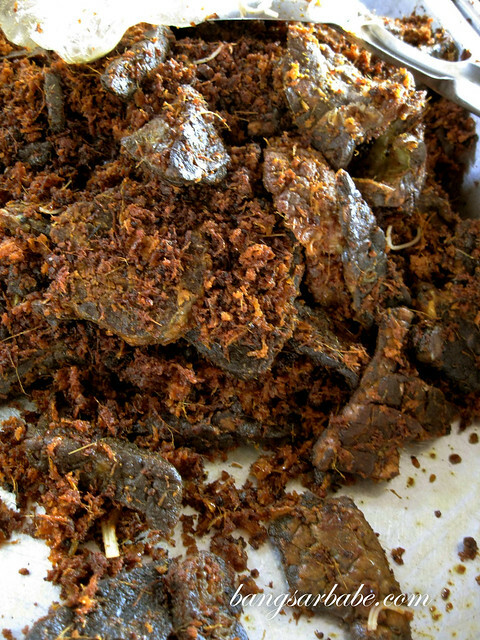 I love eating fried paru (cow’s lung) and this place serves a mean version of this dish. Deep-fried with spices and serunding, the lungs were flavourful and very addictive. It was crunchy on the outside, but tender and slightly chewy on the inside. Some people squirm at the thought of eating paru, but I love its slightly chewy and meaty texture. Plus, it has no strong smell and flavour, unlike liver or intestine. I didn’t like the bergedil (potato patty) – it tasted a little strange. I reckon they used a bit of sardine in the mixture, hence the slightly fishy taste. I prefer chicken or beef begedil. rif was less greedy. He had a piece of fried chicken and a bull’s eye (RM5). The fried chicken was seasoned with some spices, making it aromatic and flavourful. I had a bite from rif, and found the meat juicy and surprisingly not greasy, despite being deep-fried. Parts of the skin were not as crispy as I liked it to be, because it came in contact with the gravy. Nonetheless, it was still every bit scrumptious. He also helped himself to plenty of serunding, which was fried together with the chicken. The rendang gravy is good stuff! It was a very good breakfast; artery-clogging, satisfying and lip-smacking good! They are open for business daily from 6.30am till 11.30am, or until they run out of nasi lemak. 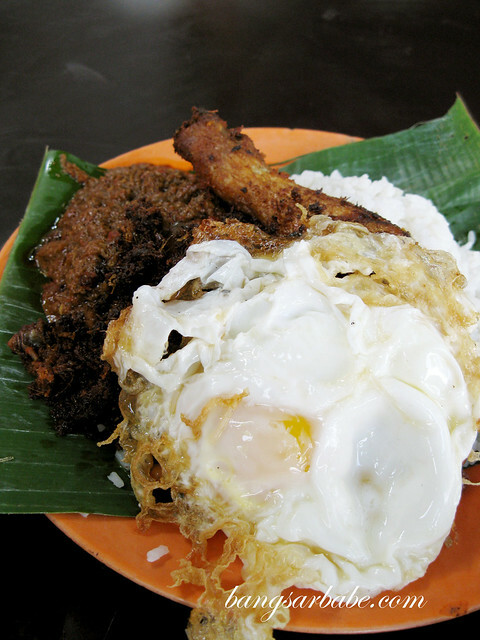 Click here to view my video blog featuring this nasi lemak. UPDATE (14/12/13): The nasi lemak is still tasty, but standard has dropped since 2009. These days, the rice isn’t as lemak. But it still remains one of my favourite places for nasi lemak. 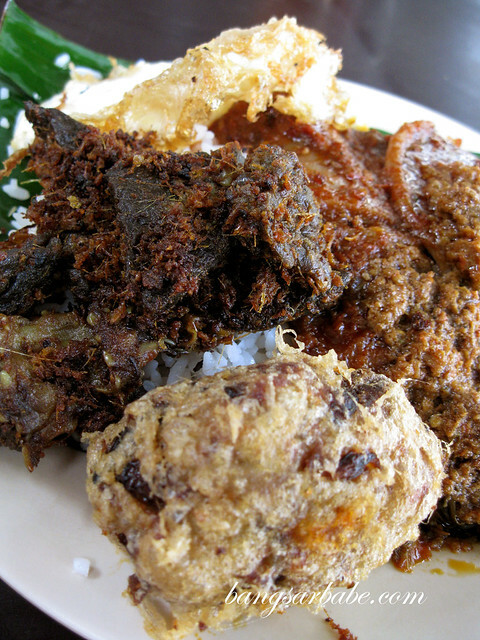 Verdict: If you love a hearty plate of nasi lemak, give this a try!